Here you will find useful links, forms and other resources for NCWGA. If you have a link you believe is useful to people interested in breeding naturally-colored sheep, please submit it to Kate Lowder. These files are designed to be printed or saved to your computer for future reference. Are you interested in being added to our Preferred Judges List? Then print and send in our Letter to Judges. Sheep 101, everything you could want to know about raising sheep. Merck Vet manual, the ultimate online resource when you have a problem with your sheep. Maryland Small Ruminant Information, another reference for sheep breeders. North American International Livestock Exposition, the largest livestock show in North America. Black Sheep Gathering, in Eugene Oregon, is one of the oldest and largest sheep and wool festivals in the country. Region 1 – California, Idaho, Montana, Nevada, Oregon, Washington. Region 2 – Arizona, Colorado, Hawaii, New Mexico, Utah, Wyoming. Region 3 – Canada, Arkansas, Illinois, Iowa, Kansas, Louisiana, Minnesota, Missouri, Nebraska, North Dakota, Oklahoma, South Dakota, Texas, Wisconsin. 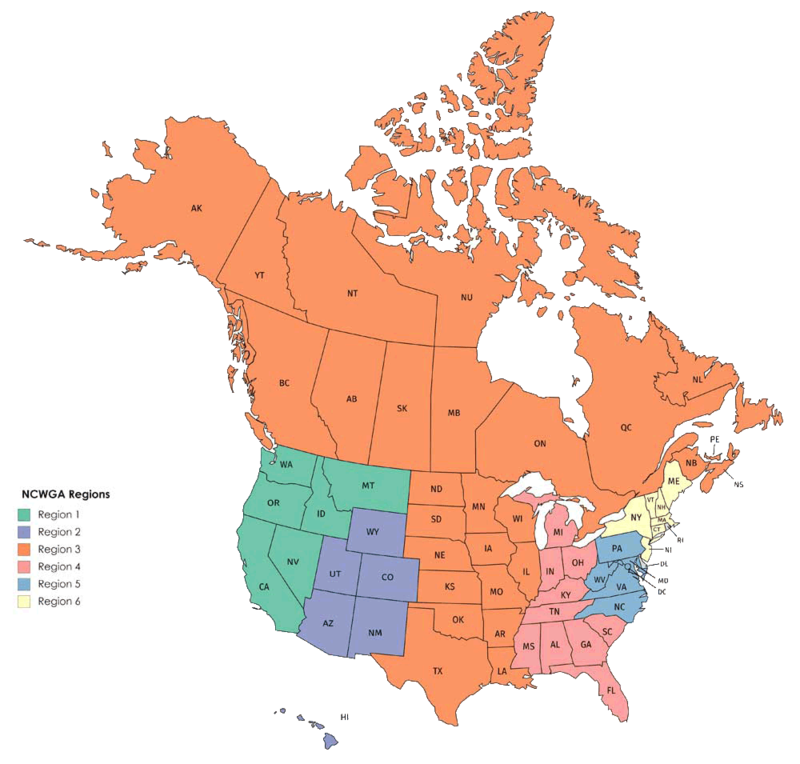 Region 4 – Alabama, Florida, Georgia, Indiana, Kentucky, Michigan, Mississippi, Ohio, Tennessee, South Carolina. Region 6 – Connecticut, Delaware, Massachusetts, Maine, New Hampshire, New Jersey, New York, Rhode Island, Vermont. Our MISSION is to assist NCWGA members in the improvement, promotion, development of naturally colored sheep and the colored wool they produce. In 1977, NCWGA was formed as a non-profit national organization to support these common goals. The growth and popularity of hand spinning, weaving, felting and other wool crafts have resulted in a demand for the wide variety of naturally-colored wool. No Dyes Needed. The Modern handcrafters and fiber artists are more knowledgeable, discriminating, and demand higher-quality fleeces than those required by the textile industry. Since 1977 NCWGA has recognized the need for high-quality wool sheep that produced a high quality and very useable product.